Home | News | What does the Old-Drava provide us? What does the Old-Drava provide us? One of the key elements of our project is to map out why Old-Drava oxbow is important for locals, to whom it is unique and why it is useful or precious. In order to find it out, we have organized four meetings with the participation of nearby residents, anglers frequenting the Old-Drava, foresters, fishermen, nature protection and border control officials, hunters, farmers, researchers and others concerned with the oxbow due to their official tasks. We organized meetings both in Hungary and Croatia, so we could learn from the residents of both sides of the oxbow what Old-Drava provide them and what the border of the two countries means in their mind. The goal of our survey was to demonstrate the importance of the conservation of natural areas not only from nature protection perspective. Natural habitats, like the Old-Drava or the Drava river, serve the nearby population in many ways and at the same time are indispensable for sustaining the welfare and prosperity of the whole planet and humankind. During the past decades, one of the focus areas of scientific research was exploring this relationship of nature and humans, which is easily veiled by our ever-growing civilization. These researches, like the outcome of the meetings regarding the Old-Drava, have made it obvious that rivers, lakes, oxbows and other natural habitats provide diverse “ecosystem services” to humans. 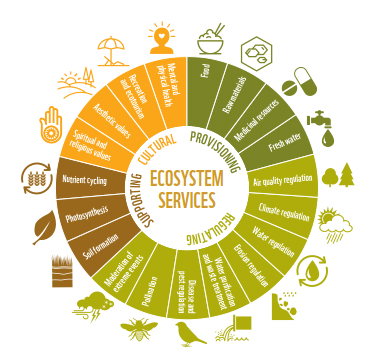 These services comprise natural water-purifying ability, maintenance of the soil's fertility, reduction of effects of droughts and floods, these services provide relaxation, tourism and bird watching or angling opportunities, or ensure drinking water supply. 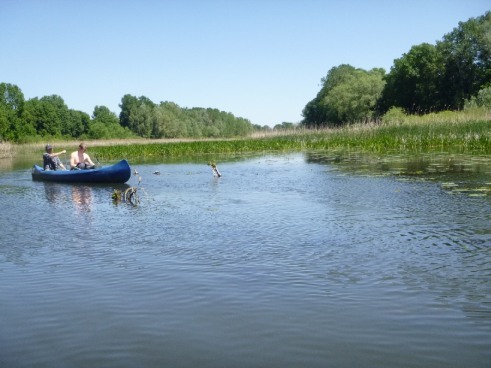 We learned a lot of new information from the locals about the past of the oxbow and its surrounding area on the Old-Drava forums in the Hungarian side. A lot of people, whose families have lived in or around Barcs told us that a few decades ago the open water surface has been much bigger and wider that has been excellent for relaxation or swimming and huge fish was caught from the oxbow. The fish was kept fresh until sold covered in nettle abundant on the oxbow shores. During these times, the area was more dense in forests and really huge oak trees were almost common phenomena. Throughout history, the river Drava and its floodplain have provided a rich living of its residents. No wonder, that according to the findings of the local archaeologic sites, this area has been inhabited from the prehistoric age. Unfortunately, the current situation is not so perfect. Everyone stated that since it didn’t have connection to the living river, the water supply of the Old-Drava declined and as a consequence, it was hit by water depletion mainly during long and arid summers. Due to that it is very uncommon that anybody goes down to the oxbow just to visit it. Despite the continuous fish reintroduction efforts, you can barely fish and due to that the previous fishing camps have been abandoned. We have presented in the forums the proposed activities of the LIFE project and wanted to find out whether this would lead to make the oxbow able to provide its previous benefits once again. Everyone welcomed the construction of a water retention sluice, as it will improve the water supply. The anglers were specifically indicating that if the water surface was bigger, they would be more inclined to make more frequent trips to the Old-Drava. The renovation of the fishing platforms is also beneficial for them. The educational path to be created in the forests, canoeing options and bird watching led by the employees of the Duna-Dráva National Park will also prove to be an attraction to many potential visitors. Almost 15 participants came to the forums on the Croatian side and the active participation reflected not only in numbers but in the comments of participants. Due to the vicinity of the town of Križnica located between the Old-Drava and the Drava river, there are more people in direct contact with the project area from the Croatian side. Human presence is much more pronounced here and therefore the natural environment is subject to more significant human effects. The people from the Croatian side are very proud of the fishing opportunities, the unique natural values of the Old-Drava and the surroundings of the oxbow being an oasis of relaxation. They would very much welcome if this area so precious to them was known to more people and there were more tourists who visit the oxbow. However, they do see the risks of this, and would therefore welcome guests arriving by canoes, row-boats or bicycles, thereby supporting the development of eco-tourism possibilities. It was clear from the comments that people would like to preserve the values of the Old-Drava and are happy with any initiative that would enhance its water supply.